In the culinary world, these neighborhood residents are the perfect family. 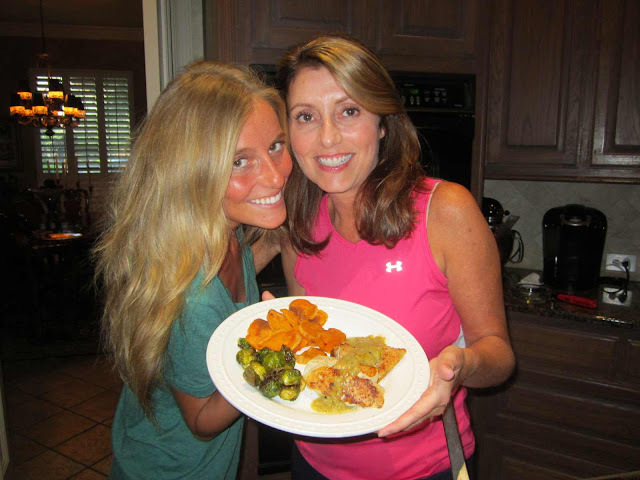 Sally and daughter Morgan love to create and cook, while husband and son love to EAT! Despite a busy lifestyle as wife, mother of two, sales executive, and volunteer, Sally and daughter Morgan (student at Oklahoma University) do not fail to disappoint when it comes to preparing a delicious and well-thought out meal. When Sally and Morgan decided to create dinner for this magazine, they had a set of three goals which must meet their “approved criteria”: 1) it must be nutritious 2) you can make it in under an hour 3) it must be delicious! The dinner they created aligns with their cooking goals by combining their love of fresh fish and seasonal vegetables. “If you have not tasted barramundi fish, then head over to your favorite fish monger and buy some” Sally says. Hopefully you will enjoy this meal as much as these neighborhood residents do. Bon Appetite! 1. Bring the barramundi close to room temperature. Season well both sides of the fish with Montreal chicken seasoning (one side with skin on). 2. Prepare the saute pan with 3 Tbsp. olive oil. Place skin side down first and cover with a lid until halfway done (approximately 5-7 minutes). 3. Turn the fish over and squeeze half of a lemon on top of the fish. Pour 1/4 cup chicken broth into pan and cook remaining 5-7 minutes. Check the inside of the fish to ensure it is cooked through. 1. In a saute pan, cook the garlic for approximately 2-3 minutes in 1 Tbsp. olive oil, and then pour 2-3 cups of the Green Chili Stew into the pan, on medium heat for 5 minutes. Add 1/2 squeezed lemon and cream to the stew and cook on low for 5-10 minutes. The flavors will meld together. Salt and pepper if desired. 1. Skin the sweet potatoes, cut into horizontal halves, then into thin rounds, and put them in a bowl with 1/4 cup olive oil, Montreal seasoning, and red pepper flakes. Toss the potato rounds to ensure they are evenly coated. Place in a single layer on baking sheet. 2. Cook the potatoes at 400 degrees F for 10 minutes, then turn them over. Cook until a little crispy around the edges (approximately 10 minutes). 1. Wash and cut brussels spouts in half, let some of the individual leaves fall from the core (this will make delicious, crispy brussels sprout leaves). Put the sprouts in a bowl, toss with remaining olive oil, Montreal seasoning and red pepper flakes. 2. Place in the oven at 400 degrees F. and cook for 20 minutes (or until they are soft but not mushy). 3. 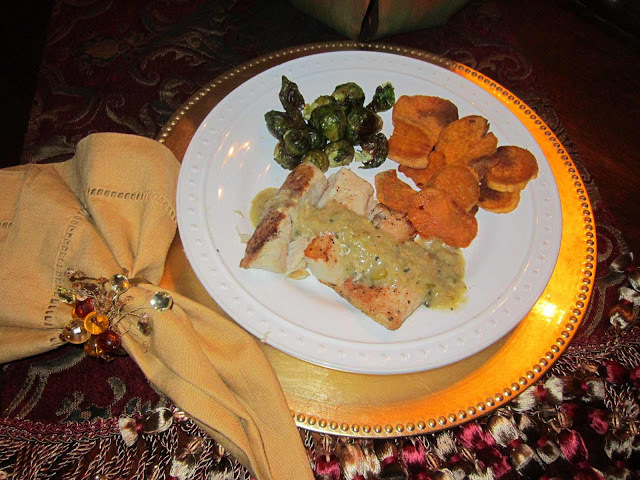 Divide the fish onto 4 plates (skin side down) and top with green chili stew. Spoon out the brussels sprouts and sweet potatoes.